Popularity of option trading contributes to the emergence of a huge number of brokerage companies, but there are brokers who, despite the active growth of competition, continue to be in the lead within their niche on the financial market. One such company is Binomo. Today, this broker may be called one of the most worthy companies ensuring efficient binary options trading due to the high quality of its services. Binomo is a young ambitious broker, standing out among the old-timers of the option market with its “fresh” approach to providing a set of services for option trading, and client-oriented policies. In fact, the company fits both for beginners and professional traders, since the company’s has service package for each category of financial market players. All aspects of modern trading are considered on the company’s site – reliability confirmed by the license of the financial regulator, security ensured with modern SSL security certificates, high-tech features implemented in the proprietary trading platform and loyalty expressed in the availability of trading conditions. And to prove these facts, we suggest analyzing the services of the broker. After having appeared on the market, the broker decided to combine two most important factors of successful trading on its site – favorable trading conditions and a professional platform. The minimum deposit requirement is reduced to $10, so that trading in the futures market is available to players with any funds available. The minimum lot is only $1, so even with such a minimum investment, a trader may competently calculate the risks. It is worth noting that the level of profitability of contracts in the company makes up 85% on average and may reach 90%, which allows you to quickly multiply the amount of your deposit. In its platform, the broker has implemented modern technologies for trading and market forecasting. With the help of the described options, a trader can use all possible trading strategies and forecasting approaches, and thus generate more accurate forecasts for transactions to be made. In addition, due to the technology of high-speed uninterrupted operation, the clients of the company can make transactions at the most profitable levels. It is worth noting that you can trade on this terminal using a demo account – for this purpose the broker provides you an unlimited amount of virtual funds and the ability to carry out training in real market conditions. For beginners, this is an excellent opportunity to learn trading without the risk of losing their funds, and for experienced players – a safe field for creating and testing various trading strategies. You can open an account with the company within a few minutes. 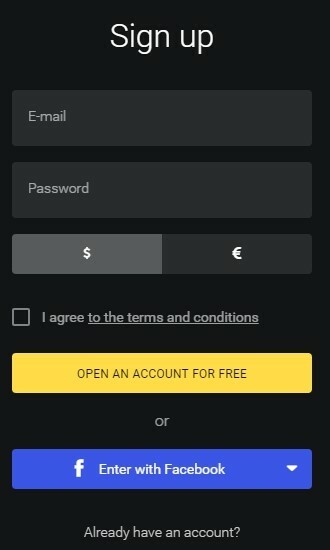 On the central page of the site, there is a quick registration form where you need to specify the minimum set of data – email, password and deposit currency. After confirming the registration through the link in the email, you can get an access to your back office, where you can update your account with the personal data. It is worth noting that the broker does not require additional verification – it’s enough to top up your account with the desired amount of funds and within a few minutes after the funds are deposited to your account, you may start trading. 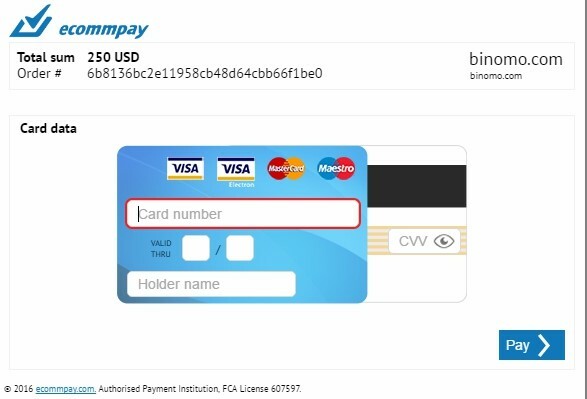 In terms of payment services, the broker supports the following payment providers: MasterCard/Visa, Neteller, WebMoney, Yandex.Money, Qiwi, which allow the funds to be instantly credited, and the profit can be withdrawn within 4 hours to 3 days, depending on the amount of the deposit. 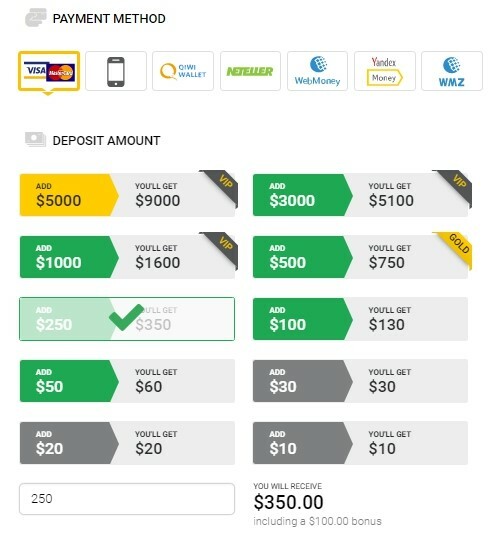 It is also worth noting that the topped up amount depends on the type of the trading account: Standard, Gold or VIP – with a certain package of additional services. As it was said before, not only experienced traders, but also beginners can successfully trade using binary options on Binomo. The broker has created an extended training program, which is implemented in the form of an interactive tutorial, video tutorials, step-by-step instructions and a stock exchange glossary (knowledge base). Thus, even players with zero knowledge can quickly learn the art of option trading. The company provides its clients not only with classic bonuses for the first and repeat topping up, but also constantly makes interesting promotional offers and organizes tournaments where traders with any type of account, including a demo account, can get an opportunity to improve the effectiveness of their trading or to receive a prize with real money. Thus, today Binomo is one of the most interesting binary option brokers, where traders can get a full range of services to ensure their effective trading.